Chocolate and Rose buds? Of course this was always going to be February's tea of the month! The most romantic of all teas... It will be love at first sip! An attractive deep dark look of black tea and cocoa kernels, highlighted with bright pink rose petals. 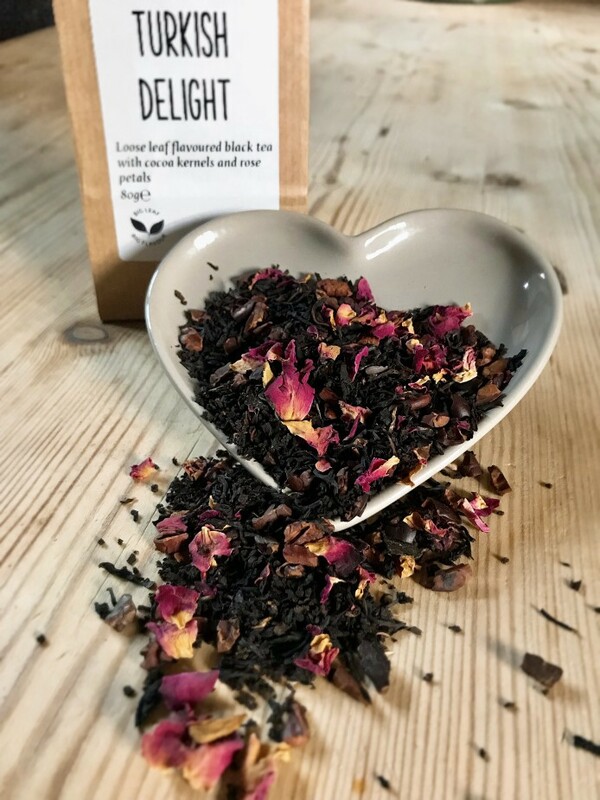 Using cocoa as an indulgent starting point, then adding black tea, rose petals & natural rose oil - a stunning tea and a nod to the traditional chocolatey Turkish delight flavour that we know & love today. Turkish Delight is indulgent, sumptuous and dangerously addictive, especially in tea form! But you can sip away until your heart's content as there's no calories!!! If you haven't tried this tea yet, you'll be blown away with just how much this nostalgic flavoured black tea tastes exactly like the much loved chocolate bar! If you have tried it, you'll know exactly what we mean. "A Beautiful tea. Roses and chocolate. One sniff calms my senses. The taste is sublime." Turkish Delight will be half price the whole month of February- get yours for just £2.55. The perfect time to stock up if you love it, or try if you haven't already! Why not give our Turkish Delight cheesecake a go? Or perhaps you would prefer Turkish Delight Pancakes?